There are nearly 400 species of birds in Nebraska and about 200 bird species nest in our state. By providing suitable habitat which includes food, water and shelter, you can enjoy birds and other wildlife year-round. For those of us who enjoy watching wildlife, bird feeding is an easy way to enjoy the behavior of wildlife up close. Providing a source of fresh water is also important especially in winter when birds and other wildlife have less access to fresh water. It is easy to add a bird bath to your yard. Bird baths don’t have to be expensive. Many people are able to make bird baths from resources they have around the home. Even an inverted garbage can lid or shallow pan can be used as a bird bath by placing it on the ground or attaching ropes and hanging it from a tree. The most important factor to consider in purchasing or making a bird bath is to keep in mind what the birds prefer. Birds do not like slippery surfaces. They like rough surfaces like concrete. If you already have a bird bath, add bathtub stickers to create a nonstick surface. You can also add pebbles to the bottom to help give birds better footing when bathing and drinking. It is important your bird bath should only be two to three inches deep. Birds that feed at your feeders will use a bird bath placed above the ground or suspended from a tree. Consider adding another bird bath on the ground to mimic a puddle which will attract other birds and wildlife like squirrels. Before putting a bird bath on the ground, consider predators like cats in your neighborhood who might prey on the birds and wildlife. In winter, you’ll need to find a way to keep the water from freezing over. 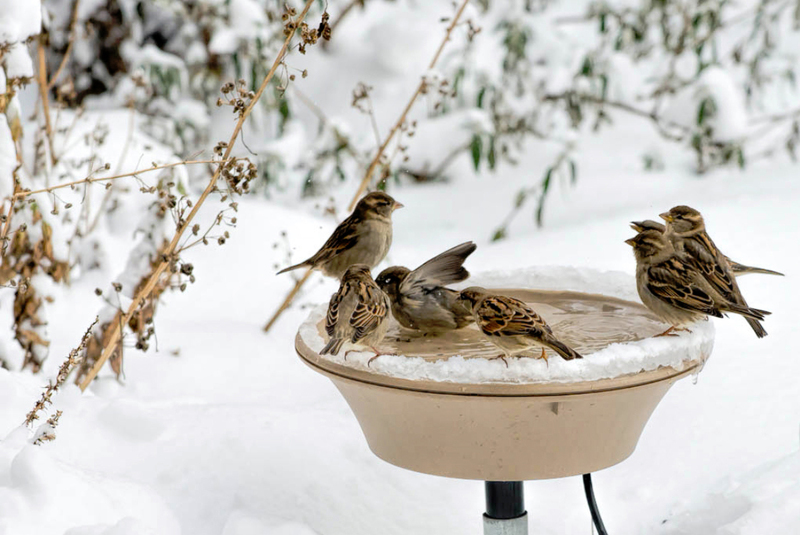 You can purchase heated bird baths or buy a submersible heater for your bird bath which will need plugged into an electrical outlet. Solar heaters are also available but these do not work on cloudy days (DeCecco & Brittingham, 2016). It is important to keep your bird bath(s) clean. Change the water regularly and if needed, scrub the bird bath with brush and mild soap, then rinse well. If you feed birds or have bird baths, it is important to examine shelter sources in your habitat to help the birds escape predators. Place bird baths in a location near a tree or shrub with low branches for the birds to escape from predatory hawks. The sharp-shinned hawk and Cooper’s hawks are accipiter hawks found in our area. Cooper’s hawks are here year-round. Both hawks quickly maneuver to chase and capture birds. Daniel Burden, program specialist from Iowa State University, suggests building a predator-exclusion feature to help birds escape from accipiter hawks. He recommends putting a perimeter of old chain-link or similar fencing around a brush pile, evergreen shrubs or pine tree. The holes are large enough in the chain-link fence for birds to quickly fly through to escape. The hawk will be too big to get through the fence. Burden also stated these areas of fencing when covered with snow, provides a protected area for birds to roost. WHAT IF A HAWK STAYS AROUND MY FEEDERS? If a hawk begins to prey regularly on birds in your yard, take down your feeders for a couple of weeks. Your bird baths can be moved closer to landscape providing escape. When the hawk moves on, put your feeders back up and the smaller birds will return.